Most, if not all of those that have spent time outdoors in New Zealand’s summer, will recognise this noise: Weep weep weep weep weep woooooop (click to listen). Few of these people, however, will have actually seen the creature that belts out this long, repetitive whistling tune. The reason for this is perhaps down to its small size, cryptic colouration and habit of remaining high up in the tree tops. This mystery whistler only calls during the summer here in New Zealand because in the winter it travels great distances to the tropics. Another fascinating aspect of this creature’s life history, other than its long annual trans-oceanic migration, is that it is a brood parasite. It will lay its eggs singly in the nests of tiny grey warblers (Gerygone igata) by removing one egg from the warbler’s nest and replacing it with an olive-green egg of its own. This intriguing bird is the shining cuckoo, and the subject of today’s blog post. Since getting hold of a long-reach lens (Tamron 150-600mm) for my Nikon D500, I have been lugging it around in the hope I would be lucky enough to hear a shining cuckoo, pin-point which tree it is in and hone in on the branch it is sitting on. Despite the enormous length of time I spend outside and the numerous birds I have heard, getting to even see one through the lens has proven nearly impossible. Recently, we spent some time camping at Ruatiti Domain in the Ruapehu District. We had been planning this trip for awhile, so when a subtropical storm was forecast to roll in, we decided to brave the weather, even if it meant very wet walks and sitting in the caravan for days on end. The first few days gave us a continuous deluge of heavy rain. Very few birds were heard or seen from the window of the caravan during the downpour. At around 5am while lying in bed, I realised that the rain had suddenly stopped. The birds began to sing as the sun was rising and amongst the cacophony of songs, I could hear numerous shining cuckoos. I snatched the camera from the darkness and stepped out into the morning light. For the next 30 minutes, I could hear and see roughly 10 shining cuckoos high in the canopy of a few trees. As the light improved, I snapped away hoping that one bird would drop low enough for me to get a clear photograph. Eventually the opportunity presented itself and I took these three crisp photographs and then all the birds were gone. Their most recognisable call is a string of ascending whistles followed by one or two descending whistles. Other calls they make can be heard here. 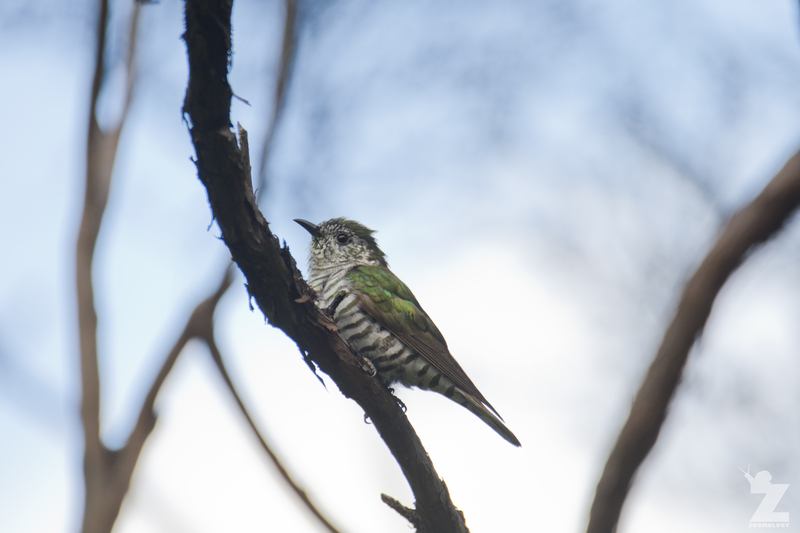 The shining cuckoo is one of two cuckoos found in New Zealand, the other being the long-tailed cuckoo. 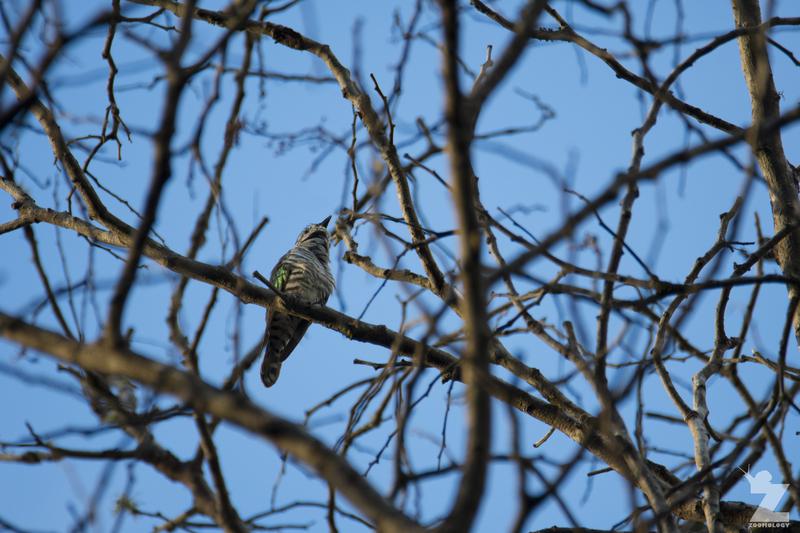 Little is known about the migration patterns of either species of cuckoo found in New Zealand, so researchers are keen to find out all the information they can. They are particularly interested in the dates the cuckoos arrive at each part of the country. You can also add your pictures and log your sighting on NatureWatchNZ (the New Zealand branch of iNaturalist). What beautiful photographs and thank you for the information and the links. Shining and long tailed cuckoos are annual visitors to our place. I had a wonderful experience early one morning when I was out watering the garden. A shining cuckoo decided the hose was it’s personal shower and spent half a minute or so having a good wash. It flapped it’s wings under the water one way and then turned and washed it’s back the same way before tootling off to start it’s day. A magical privilege. But oh the things you see when you haven’t got a camera. Thank you, Wendy! You’re welcome. You sure got a good look at all these cuckoo birds for very few being able to be lucky enough to get a glimpse of them. Sounds like a very satisfying trip! Just discovered your blog, very informative, nice images. Nice to see wildlife from the other side of the world. Regards Brian. Still to see one of our cuckoo’s. Hopefully this year. What a beautiful species! Great photographs too! You’re welcome, Sanna. 🙂 I’m glad we could share them with you!